The seventeenth century houses of Briançon have good reason to hide behind the wall of the old town. With its strategic position often as a frontier town, Briançon has been attacked many times over the years. It was first occupied in the Bronze Age and then by the Brigantines. During the Romans it was part of the Cottinus Alpes governed by king Cottiusand was fortified to guard their Mons Matrona road from Vienne to Milan. 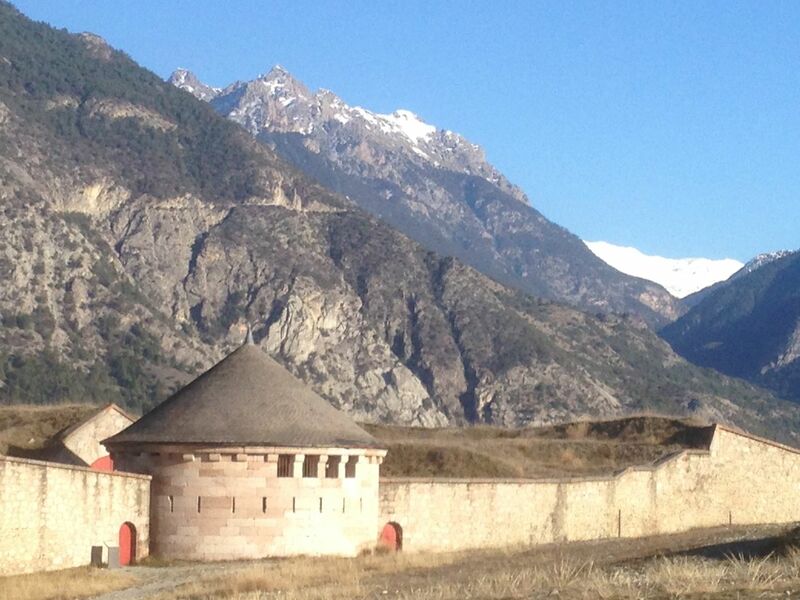 Briançon prospered during the middle ages with the signing of Le Grande Transaction with the Dauphin in 1343 allowing Briançon to become the seat of the five Escartons, five valleys two of which are now in Piedmont Italy. The Avignon popes who spent some time in Briançon, see the Popes House towards the end of the Grand Gargouille , also increased the prestige and trading status of Briançon. In the 15th century onwards numerous wars made the life of people in this strategic city more difficult. The city was almost completely destroyed by fires in 1624 and 1692 although the city retained much of its original street plan. It was rebuilt within a reinforced city wall designed by Vauban the military architect of Louis 14 th , who was sent to inspect the state of the nation’s defences on this border and also designed Mont Dauphin and reinforced Chateau Queyras and Sisteron among many other sites to cope with the threat of the new powerful canons. In fact whilst renovating the apartments in rue de Commandant Carhlian we have come across some evidence of re building after a fire and even found a small iron canon ball! The establishment by the treaty of Utrecht in 1713, of the border at Montgenevre put extra pressure on Briançon position and the city withstood a siege of 3 months at the hands of the Austro-Sardinians, there is a plaque commemorating this at the Porte Des Pignerolles, the entry point from the Champ de Mars. Briançon was a garrison town in the First World War and in the Second World War the Chaberton fort was destroyed by the French Artillery. The Alpes and Queyras were the site of considerable resistance activity during the occupation and Briançon was liberated, recaptured and re-liberated in the course of two weeks at the end of the summer of 1944. The Old town contains reminders of its history where ever you look. Enter from the Champ de Mars over the draw bridge and stop to notice the heavily defended entrance and on your left the covered canals that supplied the town’s water. To your right in an old Guard room is the tourist office which offers maps and guides for walking tours. There are guided walks of the old town in English during the summer holidays and also guided visits to some of the surrounding forts and the citadel. In front of you is the Grand Gargouille with its central gutter, in the middle ages it served as a main drain and also as a handy water source for putting out fires. It is now a useful way of enticing little people that a wander down the Grande Gargouille is worth while, when my children were small I soon learnt that this was a walk for either tevas or wellies! Pooh sticks is a great game here but watch out the cobbles can be slippery. You will pass several fountains the one on the right at the bottom commemorating the Persian engineer brought in to put in the towns water supply. Other buildings of note on the way down are the Maison des Têtes, named for the decorative plaster heads on the façade and the Maison des Papes, the pope’s house. The Place Des Armes on the right half way down now has street cafes and sometimes a giant chess board instead of parading soldiers.The Cathedral or Collegialle was also designed by Vauban and façade that is decorated with a sun dial as well as a clock. The carved wooden doors were a gift from Louis 14 th and the doors are guarded by two lions of St Marc, reminders, as is the street name and the tourist office building, of the importance of the knights templar in the history of the area. The Petit Gargouille runs down from this square with another smaller central gutter. Other places worth visiting are the church des Cordeliers with its 14:15 th century frescos and the defences centred on the Porte d’Embrun at the bottom of the Old Town . The Pont D’Asfeld is an impressive site and allowed a liaison between the town and the forts ;. It is 55 meters above the river and was completed in less than four months! There is a way marked walk from here to the Fort des Trois Têtes, then on to the Fort des Randouillet, the Grande Y a covered walkway that connected this to the Fort Dauphin which protected the Fontchrisian valley. This walk gives an insight into the designs of Vauban. From the Porte de Embrun there is a walk signposted through the Vergers or Orchards which are being replanted to the Parc de La Schappe. A pleasing, renovated, turn of the century park gives a view of the hydroelectric scheme dating from the same era. Continue up the bank for an impressive view of the Pont D’Asfeld from underneath. Back down stream you come to the old silk weaving factories of La Schappe and on to the busy road of the more modern Briançon of St Catherine. Signposted off the RN 94 past Embrun on the road to Savines is the Abbaye de Boscodon. It is worth a visit for the simple beauty of the buildings and that of its surrounding forest and many well marked trails. The abbey was founded in 1130 and housed a closed community of Cistercian monks. The church was built using natural ratios with a religious significance. This and the simple tastes of the Cistercian order have resulted in a building of beautiful simplicity and proportion. The abbey fell in to disuse after the revolution and was used as a agricultural building until the Friends of Boscodon acquired the building in 1972 and started its restoration, much of it with volunteer labour. In 1996 a religious order was re established and the restoration is now almost complete. The cloisters are open to the public for a small fee, entrance to the abbey is free, there are exhibitions in the aumenerie. Next to the abbey there is a Gite which serves snacks, notably courgette flower fritters from its large vegetable garden in the summer. The trails in the surrounding forest are way marked and there are notices explaining the flora and the flood prevention measures taken on the torrent of Boscodon itself. There are also numerous picnic sites in the forest many of which have barbeques. Saint Veran is the highest village in Europe and has conserved to a large extent both its traditional street plan and style of building. The houses here are built on a stone ground floor containing a workshop, winter sheep quarters and a stable for the mule, cows and pig which doubled as the families’ living quarters certainly over the winter months Some families had rooms above for the summer. Above the rest of the structure was built of wood with Interlocking cross laid beams and large deep balconies. This area was used for drying wood, hay and other food stuffs to get the family and their livestock through the winter. This then also provided insulation, which, combined with the heat generated by living with the animals, protected the people from the Winter’s chill. Obviously with such inflammable building materials and the lack of liquid water, fire was a major threat and this accounts for the street plan with the houses all spaced out to avoid its spread. The old fire station near the church is worth a visit. The Old House at the north end of the village is a museum that is well worth a visit .It is a reconstruction depicting life 100 years ago but you realise most of it could be 500 years ago, the life of subsistence farmer having changed little in that time. It also houses an interesting display of photos from the early 20 th century. There is another old house at the bottom of the village, which claims to have been inhabited in the old style until 1976, which is full of old utensils and again shows the style of life well. Perhaps the most interesting thing about this display is the old man running it who lived in the house until he was 25. The Four Banal is worth a visit too, it houses a display of the history of the copper mines of the area, the old buildings of which can be seen further along the valley. The four itself is relatively recent but the building is older. The supply of fire wood was limited and so bread was baked only twice a year. The dough was mixed in huge wooden chest or Petrins and then was formed into round loaves which were decorated with the families mark. The family then took their turn to bake their bread in the communal oven or Four Banal. The bread was taken out using huge wooden paddles and put to cool on racks the supports for which are still visible protruding from the walls. The bread was then stored in special racks in the houses where the dry atmosphere prevented it going mouldy. The bread was cut into crumbs using a special bread cutter and usually eaten in soup probably cabbage, onion or leek. These Four Banal are visible in most villages in the area, and are often lit for village festivals when bread and tourtes are baked and sold.